Over the past two decades we’ve discovered thousands of diverse worlds orbiting stars other than our Sun. How do these diverse planetary systems, including our own solar system, come to be? Stars are born in cold, dark clouds of gas and dust that are pulled together by gravity. 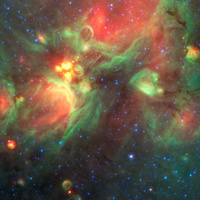 We need infrared and radio telescopes to see both the natal clouds and the embryonic stars within them. These stellar nurseries are crowded—they tend to churn out hundreds of stars, not just one. Indeed, we have good reason to think that even our sun formed in the company of many “siblings.” This presentation will explore research into the “pre-natal” development of stellar nurseries, including some of the recent results made possible by volunteers working on the Milky Way Project (https://www.zooniverse.org/projects/povich/milky-way-project), a citizen science initiative that is part of Zooniverse, the world’s largest and most popular platform for people-powered research.